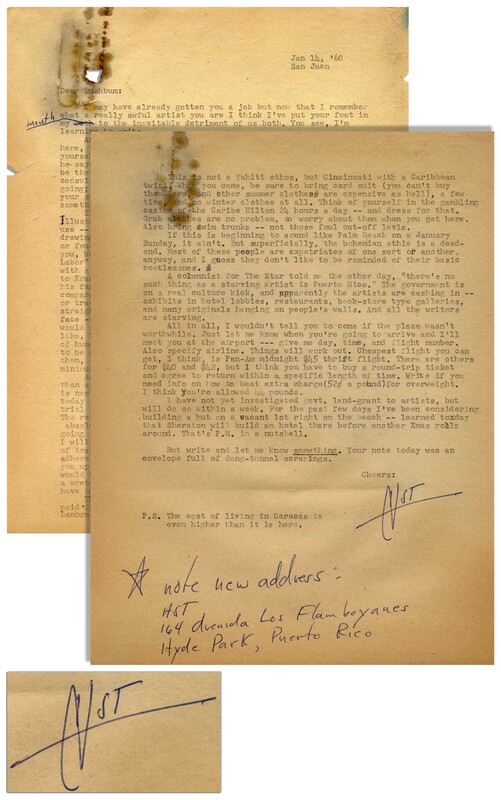 Hunter S. Thompson letter twice-signed ''HST'', composed on 14 January 1960 shortly after arriving in San Juan, Puerto Rico to work for ''El Sportivo'', a magazine for bowling aficionados. In this funnily caustic letter, Thompson lampoons the editor of the paper, Philip Kramer who'll ''be trying to hire himself out as a bowling consultant'' if the magazine shutters. 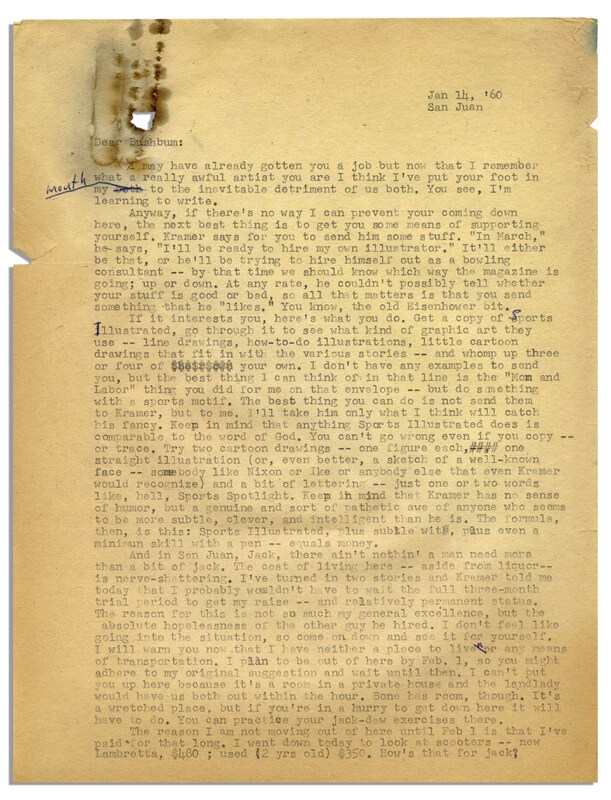 Thompson also advises his friend Paul Semonin how to get hired as an illustrator at the paper: ''...he couldn't possibly tell whether your stuff is good or bad, so all that matters is that you send something that he 'likes.' You know, the old Eisenhower bit...here's what you do. Get a copy of Sports Illustrated, go through it to see what kind of graphic art they use -- line drawings, how-to-do illustrations, little cartoon drawings that fit in with the various stories -- and whomp up three or four of your own...Keep in mind that anything Sports Illustrated does is comparable to the word of God. You can't go wrong even if you copy -- or trace. Try two cartoon drawings -- one figure each, one straight illustration (or, even better, a sketch of a well-known face -- somebody like Nixon or Ike or anybody else that even Kramer would recognize) and a bit of lettering -- just one or two words like, hell, Sports Spotlight. Keep in mind that Kramer has no sense of humor, but a genuine and sort of pathetic awe of anyone who seems to be more subtle, clever, and intelligent than he is. The formula, then, is this: Sports Illustrated, plus subtle wit, plus even a minimum skill with a pen -- equals money. And in San Juan,-Jack, there ain't nothin' a man needs more than a bit of jack. The cost of living here -- aside from liquor -- is nerve-shattering. I've turned in two stories and Kramer told me today that I probably wouldn't have to wait the full three-month trial period to get my raise -- and relatively permanent status. The reason for this is not so much my general excellence, but the absolute hopelessness of the other guy he hired...This is not a Tahiti ethos, but Cincinnati with a Caribbean twist...Think of yourself in the gambling casino of the Caribe Hilton 24 hours a day -- and dress for that...Also bring swim trunks -- not those foul cut-off levis. If this is beginning to sound like Palm Beach on a January Sunday, it ain't. But superficially, the bohemian ethic is a dead-end. Most of these people are expatriates of one sort or another, anyway, and I guess they don't like to be reminded of their basic rootlessness...The government is on a real culture kick, and apparently the artists are cashing in...And all the writers are starving...For the past few days I've been considering building a hut on a vacant lot right on the beach -- learned today that Sheraton will build an hotel there before another Xmas rolls around. That's P.R. in a nutshell. / But write and let me know something. Your note today was an envelope full of dung-tunnel scrapings. Cheers: [signed] HST''. 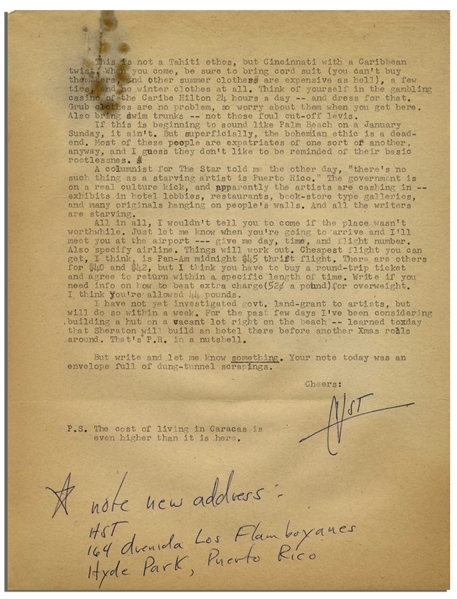 Thompson then handwrites his address at the bottom of the page, again signing ''HST''. Two page letter on two separate sheets measures 8.5'' x 11''. Discoloration and small hole from previous paperclip. Overall very good condition.